My family is full of pie lovers. Savory or sweet, full size, mini or hand pies, we like pie. 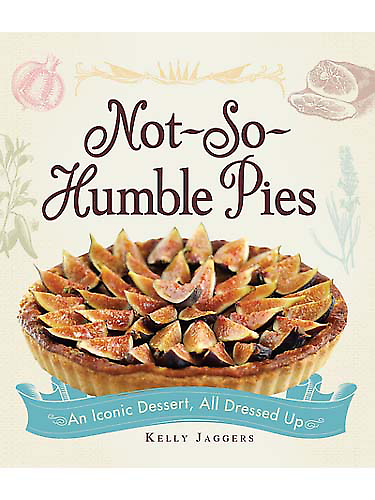 This cookbook by Kelly Jaggers is full of pie recipes. This is a classic style cookbook, while there are some gorgeous color photos, most of the pages are used for recipes. Instead of having 50 recipes all shown in full page photos, this book has over 120 recipes. 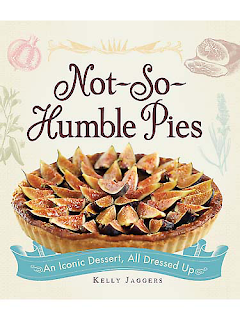 A lot of dessert pies, but there is a great chapter on dinner type pies. It starts like all good pie books should with the basics. The first chapter, pie crusts, offers tons of options. Pastry type crusts like the perfect flaky crust, butter crusts and options like a buttery, spicy cheese crust. Cookie type crusts include gingersnaps, pretzels. There are also shortbread type crusts which fall right between the two using a cookie type recipe to make a crust for a pie. The second chapter covers toppings, classic crumb toppings, meringue, stabilized whipped cream, and sauces. Creams, Custards and Chiffons.-Nothing as simple as a chocolate cream pie, these are things like cantaloupe cream, vanilla rum meringue and for people who prefer a more traditional flavor profile, white chocolate chiffon. I tried the Orange and Dark Chocolate Cheese pie which has a silky rich texture from cream cheese and a strong orange flavor from reduced orange juice. Fruits, Nuts and Berries- Based on classic recipes, these up the gourmet and wow factor, an apple pie gets a savory cheddar crust to contrast the sweetness of the apples, peach and ginger combine in a hand pie perfect for picnics. I haven't tried any of these recipes yet, but I'm looking forward to making the Strawberry Silk Pie with strawberries from my garden. Tarts, Tartlets and Rustic Pies- These are the "dressed up for guests" dessert pies. Fine ingredients, flavors and textures like apple rose, white chocolate ganache and praline cream. Dinner Pies- The savory flavors that make a main course. There are lots of tarts in this chapter as well that would work well as a side dish like the spinach and artichoke tart. Lots of cheese based tarts and pies as well. I recommend the smoked salmon and dill recipe. Spicy, Salty and Exotic Pies- This was my daughter's favorite chapter, she's got it all marked up with sticky notes to remind her which ones she wants to make first. All the chapters have exotic pies that put twists on familiar favorites. This chapter ups the ante by adding chilis, spice and salt to classics. My favorite is the salted chocolate meringue pie with it's chocolate custard base, light fluffy meringue and salt to set off all the flavors nicely.